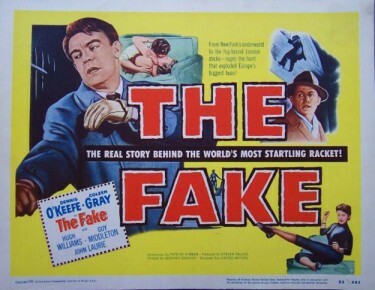 I have just received a DVD of The Fake having not seen it for years – and can’t in fact EVER remember it being on TV either. By the way it is a very good copy on the DVD. It was 1953 British crime film which starred Americans Dennis O’Keefe and Coleen Gray who came over here as many did in the fifties. Among the British actors were Hugh Williams, John Laurie, and Dora Bryan. The plot concerns an American detective who tries to solve the theft of a priceless painting from the Tate Gallery in London. In this crime drama an American played by Dennis O’Keefe is assigned to guard a US art exhibit in London to protect one of da Vinci’s most priceless paintings- Madonna and Child. A series of art thefts has put the museum officials on red alert and they anxiously await the painting’s arrival. Unfortunately, the painting is stolen en route to the show and replaced by an imitation. The intrepid guard follows the thieves to a private gallery run by a wealthy criminal. This also was actress Billie Whitelaw’s very first film. I do remember seeing this in St Albans , maybe at the Odeon, but certainly while we were down there on holiday – it was our regular holiday location for many years – and very good it is too. Can’t have been very old but I am pretty sure it was the supporting film to Raider of the Seven Seas with John Payne – which was very colourful. St. Albans Odeon Cinema – above. St Albans Odeon – the shot probably from the mid to late 1980′s – before screen 4 was added in 1988. The cinema originally opened in 1931 as the Capitol and was enlarged and reopened in 1934 when it had a staggering 1,728 seats. Renamed just after the War in 1945 the Odeon eventually closed as a 4-screen operation in 1995. It is currently being restored as the Odyssey Cinema – set to reopen in all its art deco splendour in the near future and I for one look forward to that !!! The Odeon was one of the main cinemas in the City.